There is no other way to say it- these are not your traditional hardwood floors. Palmetto Road’s hardwood Chalmers Collection is different and different is stunning. 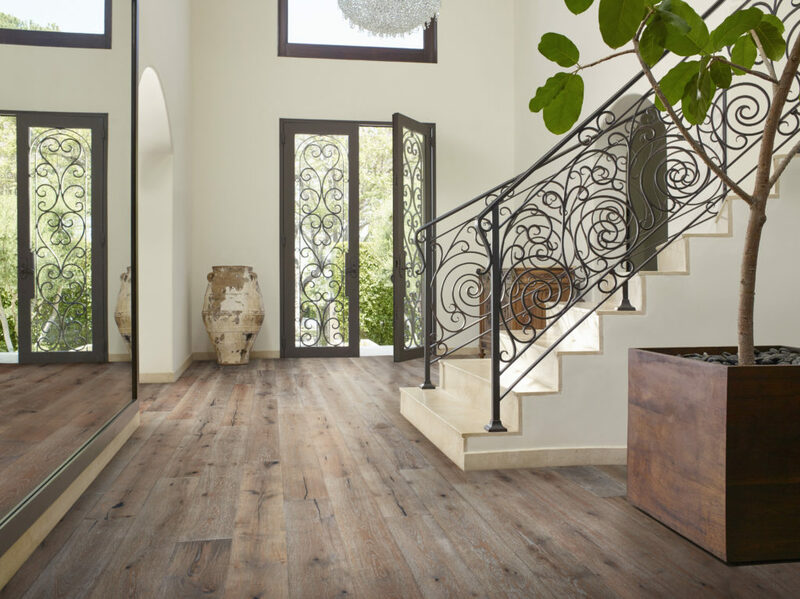 Featuring character grade French Oak and Hickory hardwoods, the Chalmers Collection offers three things that make it stand out: two-tone color stain, matte finish, custom look. 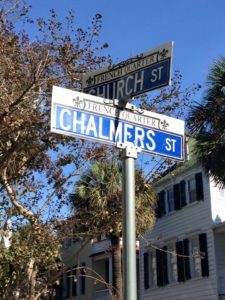 When Chalmers launched, not only was it different from other Palmetto Road hardwood collections, but it was different from any other hardwood collections on the market, period. 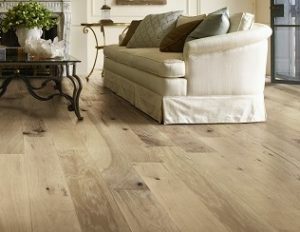 A wire-brushed, hand-distressed floor, Chalmers delivers the level of high-end design only ever offered before in custom hardwood floors… but, without the expensive price point. It is hard to say which feature of Chalmers is the most beautiful, but we are confident that the dazzle comes from the dual staining process. Each board has two stains applied by hand to create an effect unlike anything else. The hand-staining of Chalmers takes the handcrafted, artisan style of all Palmetto Road hardwoods to a new level. It is an important distinction from machine ‘staining’ and ‘wire-brushing’ processes in other flooring products. The innovative technique features one primary color to enliven the wood grain and a second color to highlight the undertone. Each shade stays true, never mixing, and is visible in clarity, transparency and hue. The colors of Chalmers range from earthy browns and grays to honey tones and washed whites. While all undertones are subtle, there are some designs that are more prominent than others. For example, Dolphin and Gunmetal clearly have blue-gray undertones that are highlighted in sunlight. Ginger and Tawny are more natural wood colors with soft gold and ivory undertones. There are many different attributes of hardwood floors that can affect the overall look of the floor and room – wood species, width and length of planks, surface treatment, and gloss level. A high gloss adds a sheen to the floors, whereas a low gloss has more of a matte finish. Palmetto Road offers collections in varying gloss levels. 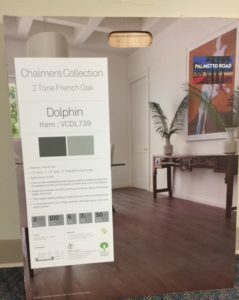 However, unlike the other collections in the Palmetto Road hardwood line, Chalmers has a 100% water-based urethane matte finish that mimics an oil based look. The process to create the look is just as handcrafted as the wood itself. It takes a 9 step process, plus abrasion between coats, to reach the exact style and character of the floors. One of the great benefits of a low-gloss hardwood floor is that hides scratches and marks making it a great choice for high-traffic spaces. 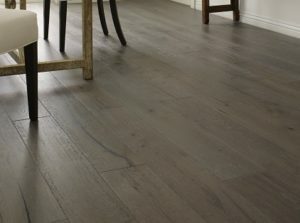 The Chalmers Collection, named after the historic, cobblestone Chalmers Street in the French Quarter district of Charleston, South Carolina, offers a total of 14 colors – seven colors in French Oak and seven in Hickory. It is a full palate of textures and colors ranging from whites to charcoal grays. When you fall in love with a hardwood floor that has so much color and character, you may think “how do I style the rest of the room?” The answer is from the bottom, up. It is important to take into account the colors that have created your Chalmers floor, but it is by no means limiting. The stains are earthy and timeless. 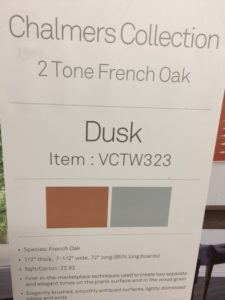 When you view the collection at a displaying retailer, be sure to look at the back of each sample board for color swatches. It shows the unique stains used to create each color which makes choosing coordinating wall color and fabric that much easier. 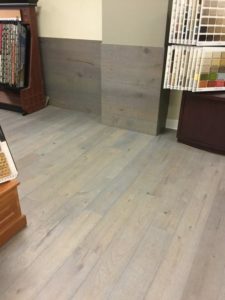 Many of the Palmetto Road retailers have on-site designers who can assist you in choosing the perfect floor for your home and style. They may also offer design inspiration such as using Chalmers to frame a fireplace or accent a wall, like Idlewood Interiors in Norcross, Georgia did in their showroom. 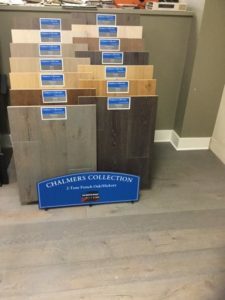 To learn more about Chalmers and to view all 14 colors, visit a Palmetto Road Flooring hardwood displaying dealer near you. To order a free Chalmers catalog, please click here.